Have you noticed the Boho trend with its organic components and handmade, vintage-looking findings and components? 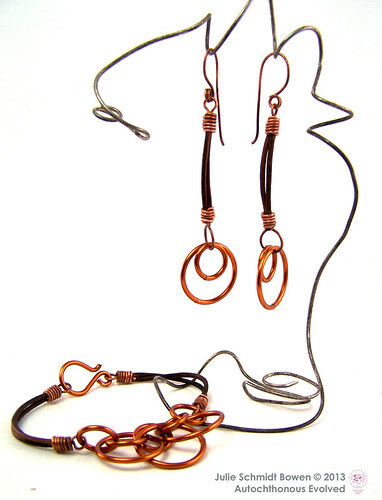 In this class Julie will walk you through the Boho bracelet and earring set that she designed, and show you how to make your own cord ends to connect the leather to other findings, jump rings, ear wires, hook clasps, and toggle clasps. Not only is this an affordable way to finish your jewelry, but a stylish way to make sure your jewelry designs have a unified theme. Cold connections are an alternative to soldering that every jewelry artist should know. We will have materials for you to rivet sterling silver, copper or brass. You may also do some embellishing and wrapping, in addition to the riveting and finishing. Beginners: Come join Julie as she teaches you how to make your very own glass beads. You'll practice safety and build confidence as you learn what to expect from glass at temperatures from 70°F to 1800°F and how to use that to your advantage making simple beads. There will be demonstrations of different steps in the bead-making process and plenty hands-on time for you to practice, with personal guidance, at your own Hothead torch station. You will leave the class having made a handful of your very own handmade beads! 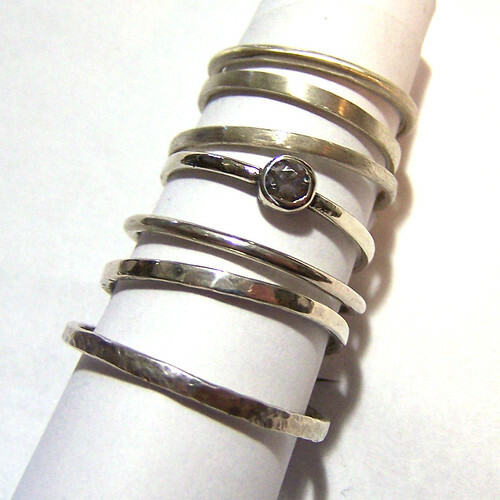 Stackable rings are a great way to learn and practice basic metalsmithing skills like sizing, cutting, filing and fitting, soldering, forging, and creating different textures and finishes. You’ll also learn how to solder a prong finding to your ring and set a small stone. An excellent class for beginners and beyond and you’ll leave with a lovely set of handmade rings. 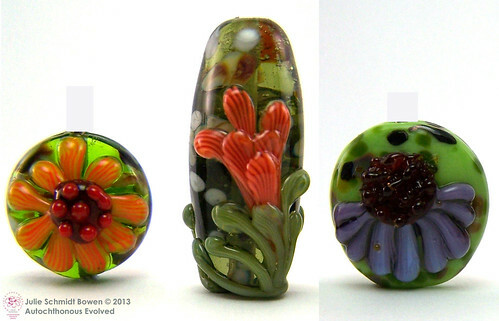 This class is for anyone with a basic lampwork class under their belt. You’ll continue to refine your lampworking skills like glass application and heat control, and learn how to use a few new tools while learning to make basic bead shapes. Shapes, like the tube, oval, cone, cube, and heart, make great focal beads and are a great canvas for surface decorations. You will also learn to make striped and layered cane which you can use to make floral designs. Even if you just want more experience at the torch, this is a great class for you! There will be demonstrations of different steps in the bead-making process and plenty hands-on time for you to practice, with personal guidance, at your own Hothead torch station. You will leave the class having made a handful of your very own handmade beads! $42 class fee + $17 for fuel, kiln annealing (overnight) and use of glass moretti rods during class. Look interesting? If you have any questions, let me know! It's A Lovefest Out Here!